I have been exposed to this process so repetitively that it has become ingrained in my mind and heart as a pattern to follow. Deep emotions are uncomfortable. They are uncomfortable to me and uncomfortable for others. If I’m really trusting God, then I can be happy. I won’t continue to grieve, right? Ironically, I don’t believe James intended for us to get the idea that we have to be strong in ourselves and ignore the difficulty and pain. He goes on to say that we should allow steadfastness (or perseverance) have its full effect so we may be mature and complete and lacking nothing. This perseverance doesn’t mean (as many of us often think) pushing forward in our faith and pushing our emotions away. In the Greek, “perseverance” is the word hupomone, meaning “to remain or endure under.” HELPS Word-studies goes on to explain that this is a God-empowered ability given to those who believe in Him to “‘remain (endure) under’ the challenges He allots in life.” Obviously, we are not being instructed to remove ourselves from the trial by our own efforts of trusting in God. Rather it is His strength working in us that gives us the perseverance and endurance to trust Him and to allow Him to strengthen us through the struggle. In 1 Peter 1, Peter echoes James’s sentiments. Peter begins by laying a foundational vision of the hope we have in Christ, the power and grace of His glory, and the promises in which we can rest assured. Then, he continues, comparable to James’ admonition to “count it all joy”: “In this you rejoice, though now for a little while, if necessary, you have been grieved by various trials” (1 Peter 1:6). But Peter doesn’t stop there. He continues that this grief (not our own efforts to count it all joy) exists so that the tested genuineness of our faith may bring Christ all the praise and the glory. And that’s our ultimate aim, right? As believers, we’re called to image and glorify Christ on this earth—not ourselves. I’ve found that if I put forth my own effort to trust God, apart from relying on Him, I deny the power of God in my life. In my pride, I believe I have what it takes to live the life of faith. However, if I’m willing to patiently endure the process of sorrow (by the grace God supplies), walking through each phase with Him, I experience His comfort, His peace, and His presence in ways that are never possible when I choose to “count it all joy” in my own strength and remove myself from feeling those deep emotions. Ultimately, He—not I—will get the glory when He brings me to the other side, full of inexpressible and glorious joy! This concept goes against everything that has been ingrained in me for so long. Grief typically equals tears. And I don’t like tears so much—at least not my own. Tears are often translated as weakness in our Christian culture. I’m a strong person if I can hold myself together. Now, tears are okay for babies, for kids, but I am a grown-up. I shouldn’t cry, should I? 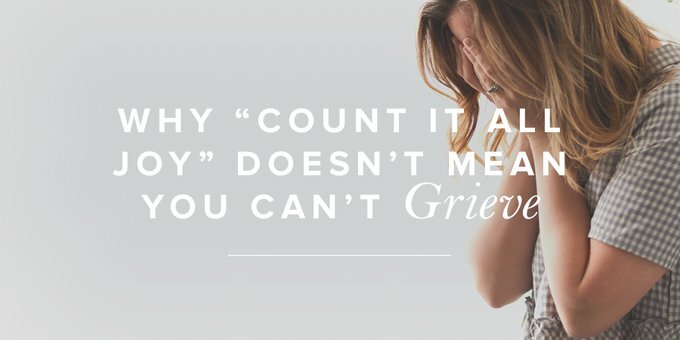 As I was processing through this concept, I came across the video, “The Healing Power of Tears,” and it opened my eyes to why crying may be a positive and not a negative. Dr. William Frey, a biochemist at Ramsey Medical Center in Minneapolis, studied the composition of different tears, and he discovered that emotional tears are comprised of water, salt, and stress hormones. Our bodies rid our physical systems of stress chemicals when we cry. Isn’t it amazing that God created our bodies with this wonderful ability? Tears serve both an emotional and a physical purpose! Tears are good. But what if visiting the pain again or allowing myself to feel the grief and sorrow causes emotions or questions that go against what I should believe to be true? I love the way Priscilla Shirer addresses these concerns in her message “Are You the Expected One?”. Check it out for help with this question. So, my friends, I’m learning that it’s not wrong to feel. It’s okay, even good, to cry. Jesus wept at Lazarus’ tomb! He didn’t simply shed a couple of tears and move on. He was deeply moved in His spirit, and He mourned along with the other Jews at the graveside (John 11:33–35). Does this mean that Jesus didn’t believe the truth of who He was? Was He not solid in His identity? Did He not know what He was about to do? Absolutely not. He was fully God, yet He chose to also be fully human. And in that moment, He suffered grief of a kind we are all well acquainted with. When we’re willing to endure through the grief rather than escaping it, Jesus can come to us and comfort us in ways we would never know otherwise. And with that comfort we can comfort others in their own struggle. The trial may cause us to ask some hard questions, but as we seek Christ for Truth, our faith will be strengthened. My friends, I know that tears are hard, but they don’t last forever. When we’re honest with God that we can’t do it on our own and allow Christ’s strength to flow through us, He gently carries us to find the deep joy that abides in Him. From our team: Revive Our Hearts is all about helping you find deep, real, and abiding joy in Christ. That’s why we bring you this blog, radio programs, books, and more—to help infuse the Truth of God’s Word into your everyday life (and True Hope into your grief). If this post or other posts on this blog have strengthened you in your walk with the Lord, would you consider joining our Monthly Partner team? These folks are the men and women who want to see others find freedom, fullness, and fruitfulness in Christ and commit to support us monthly through prayer and finances. To learn more or sign up, visit our Monthly Partner page. Thank you for reading today and supporting this ministry! Hannah Norton resides in South Bend, Indiana with her husband and boys. As a registered nurse and wife of a paramedic firefighter, Hannah has ample experience caring for the physical body. She has a passion to see women learn to walk in the freedom of the gospel, treating their bodies as the temple of Christ, and producing fruit to the glory of God! When she’s not chasing one of her five sons, she enjoys sipping coffee, photography, and all things outdoors. She delights in creatively expressing truth through writing, teaching, and event planning.